Some people naturally want to be leaders and some people are thrust into leadership, but it doesn’t matter which camp you fall under – everybody needs to learn how to be a good leader before they can actually lead effectively. If you have never had the opportunity to lead, where do you start? Self-awareness. It’s understanding your own strengths, skills, priorities, values and expectations. Set goals based on what you want to achieve. Find a mentor, and don’t be afraid to ask someone to be your mentor. Matt rejects the notion of “fake it ‘till you make it.” It’s a bad way to be a leader or a team member. A self-aware and honest leader is able to say they don’t know something in order to better understand it, and they’re able to speak up when they make a mistake. What do you need to learn to be a good leader? You have to be able to say you made a mistake, when you make a mistake. You have to be able to say you don’t know something. You have to actively add value to everything you work on. You have to be present, in the moment and focused – just like in Improv! You have to create a culture where people want to do the same. The Matt Horan School of Adding Value says adding value is basically your thoughts, your perception of how you think this should go, and being able to communicate that in a manner that somebody else can understand. It’s a critical skill for good leaders. I greatly appreciate Matt coming on to share his insight and wonderful stories – he’ll definitely be back again soon. Peter: But first and foremost, Matt, thank you so much for taking time out of your busy schedule to have a conversation with me today. Matt: You’re very welcome, and thanks for the invitation. Peter: Just so the audience to get a better idea of who Matt is, can you give us a little bit about your background? Matt: Sure. So the short and sweet: grew up in Florida, I went to my undergraduate degree at the Naval Academy in Annapolis, had an engineering degree, went to sea for six years (never used that engineering degree at all), I went back to school at University of Florida to get a law degree and practice law for six years, in Orlando, before jumping ship into the homebuilding business. I went to work for one of the big home building companies. I was a manager and then ultimately ran the division of Southeast Florida for Centex, before my wife’s job took us overseas. When I hit London, the shores of the United Kingdom, I had to decide what I wanted to do with the rest of my life and I decided I wanted to go into coaching and professional training development. That’s what I’ve been doing ever since. Peter: And I know you worked for a number of different companies, and you still do work for The Mind Gym, based out of London but with an office in New York, and your LinkedIn page states that you’re a professional development consultant. Matt: I try. That’s right. Peter: Can you describe that, or put a definition around what that is? 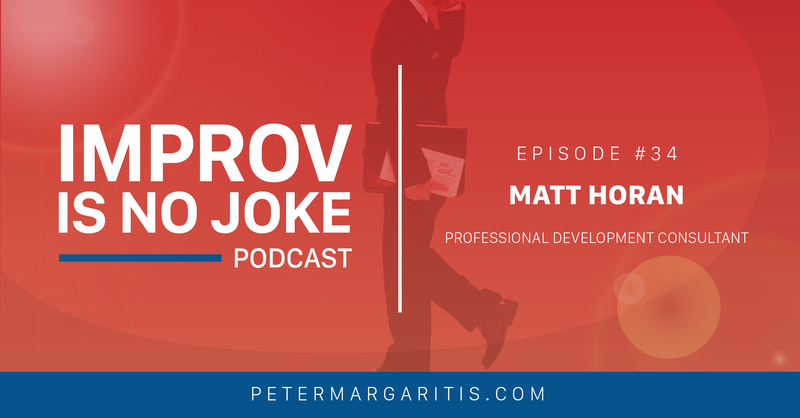 Matt: Sure, so I guess the reason I call myself a professional development consultant is what brings me joy, the reason I do what I do, is I feel like I can help people develop in their professions. I do some work with people personally, some coaching touches on personal issues, but for the most part it’s working with people who look I can empathize with. They’re working long hours, hard jobs, and if they have 90 minutes in a day (or a couple of hours) to sit through a training session, my job is to help them identify some piece of information I picked up over the years through my reading or in conversations with great people like you and help them develop their careers, and so that’s what I do. I run different training programs on different topics: leadership development, communication skills, presentation skills, although I’m not even going to try and pretend that I’m in your camp. Matt: You know, how to deal with change and how to deal with stress and and all those things that I think everybody deals with. Peter: And you just pray that Spring comes a lot quicker. So, you’ve got an engineering, naval background, you spent time at sea, and I like how you said you did that and then you went to University of Florida for law school, and at some point you mentioned about jumping ship, which was a nice tie-in to your time in the Navy. Peter: But, obviously, spending as much time as you did with the naval academy and out to sea for six years, that in itself lends it to some great leadership skills that you were able to learn and develop, even at that point time. Matt: Well, you know, I hope so, but I always say leadership is a journey. I know that may sound like one of those hokey phrases, but I do believe that becoming a great leader or just developing as a leader is a never-ending process, so if I look back on the kind of leader that I was when I was 21 to 27… I tried to do all the right things, everybody does, but I wish I knew the things I knew today. I would have done things differently. Peter: And I think leadership starts with raising your hand and going I want to learn or let me do that. I can still remember, back at the University of Kentucky, during my freshman year, we had the dorm president, dorm counsel or whatever. I raised my hand and said I want to be dorm president. Why? Maybe I thought that pickup girls or something would be a lot easier, but, as you can see, I have a face for radio. Peter: Some of us it is this innate want to be a leader. I think, for others, it may take a little bit more work, but I think it’s just stepping outside your comfort zone and putting yourself into these leadership positions. Matt: Yeah, I agree. I’ve certainly come across people who have been thrust into leadership positions, and I don’t know about you but there have been certain point in my career where maybe I raised my hand and I said I wanted to take charge, but at some point I was asked to do something that was beyond what I had imagined I would be responsible for. Matt: Similar to when I got tapped to run the division crew, for Centex. I wasn’t ready for that, in my mind, and I think, a lot of times, the first time someone becomes a leader they have that exact same experience. I work with a lot of people in professional services to people who have succeeded very well in large multinational corporations because they’re technically excellent, and then they tap them on the children and say “You know what? Now we want to run this department,” and then it’s like, okay, well what is that? Matt: And they don’t put them through any training. They don’t talk to them about it. I think you and I might even have had this conversation at some point. People will say let’s go to school to be a really good engineer or let’s go to school to be a really good account, but I’ll just maybe figure out how to be a leader along the way, while you’re managing the lives of these 30 people who are looking at you every day. Peter: Right. We have had that conversation. I’ll even pull a Peter Drucker phrase: are we providing the Peter Principle to them? Are we promoting him to the level of incompetence because they’re technically sound, and we spend the first years to ensure that they’re technically sound, and then say, okay, now go manage people. Peter: Uhh…. what does that mean? Peter: And how do I do that? And I think a lot of times, in like accounting firms, there’s this up and out mentality. I think a lot of people get to that management level and they don’t have the skills necessary to be successful at that level. Peter: We should be providing those skills earlier, and in this conversation, versus the way that the baby boomers, back in their day, had to learn it on the job. I think you would agree that the job is moving a heck of alot faster these days than it did then. Matt: Yeah, and you’re right: For a lot of people, it’s just not offered out there and you have to find time to read a book, to listen to podcasts, to watch TED Talks. Anything where you can pick up any tips about what it means to manage people because, going back to what you said, I think some people naturally have that pull. They want to raise their hand and so I think they have some sort of natural talent or gift, but even they need to develop. And if that’s not anything you’ve ever felt the desire to do, where do you start? Peter: And that’s a good question. I’ll ask this in maybe a little bit of a different way: what do you think is the number one key quality that someone needs when they want to start thinking about becoming a leader? That they might need to work on that they haven’t fully developed? Matt: This is a broad answer, but the first thing that comes to mind when I talk to people is, to be honest, self-awareness. It’s understanding your own strengths, understanding your own skills, understanding your priorities, your values, your expectations. I think, if you know yourself, then you can start to lead other people because to lead people you need to set expectations with those people. The minute you’ve taken a group of 10 people and you say this one person is gonna be responsible for the other nine, the other nine are going to start looking at that tenth person and they’re going to say, “So what does she or he want from me? What do I need to do to impress that person or to make them happy, so my life is easier?” And that’s gonna happen immediately, and so it needs to be clear in your mind what you can then tell those other nine people. This is what I want to view this is what I expected these this is what’s important to me. So I think that’s a key step. Peter: Along those lines, you said that the self-awareness is to know yourself, and I think it’s also be completely honest with yourself. Peter: But I’m not gonna pay attention to it because I really want this opportunity. Peter: But I think we need to be honest with ourselves and communicate that, okay, this is a weakness. I’ll take the role, but how can you help me straighten that weakness? The other thing that you said, with self-awareness… what’s my emotional intelligence at that point in my life? Because I’ve seen the equation IQ + EQ = Success. Peter: And how would you define emotional intelligence? Matt: Well, I mean there’s whole books on the topic, but for me it’s, number one, being aware, and it’s a great point that you said about the blind spots. And it’s an appreciation of people. Empathizing with people. You know, it’s funny. In business, you and I probably have a lot of clients who are in human resources. That’s the department that they run, but I struggle with that because I don’t think of people as resources. People are really special, and so I think it’s empathizing with people. Cueing in on body language, tone of voice when I’m interacting with people. What do people want for me? Recognizing that, if I want to build trust with people, and a lot of research shows that building strong trusting relationships is the core ability that people need as a good leader. So, if I want to build strong trusting relationships with people, I need to be able to connect with them. I need to be curious about them. I need to understand what they’re looking for and realize that not everyone in the world is exactly like me. Peter: Right. Would you also say that failure is an option, and we can’t be perfect? Matt: Oh yeah, that’s great. Absolutely true. Peter: As a leader, if my people see when I make a mistake and I’m accountable for that, that says a lot. Versus I didn’t make a mistake. That was everybody else’s fault. It wasn’t about me. Matt: Agreed, and I think you’ve probably heard of the window and the mirror parable, or analogy: a good leader, when he sees or she sees that something is done well by the team, looks at a window and says “look outside the window at my team. They’re the ones that did it.” And when something goes wrong they flip around to mirror and say “look, it’s me, it’s my responsibility.” Not just taking responsibility for it but, as you say, owning up to it because, you’re right, people can see through it. You lose credibility and you lose trust right away. Peter: People can read body language a lot better, sometimes, than they can read the words coming out of somebody’s mouth and I think you can tell when people are genuine in their response because it really comes through the body language. You mentioned about working with those in human resources. Peter: A friend of mine, who I’m going to be interviewing here a few weeks, named John Kelly is the chief people officer for White Castle Systems. Matt: Yeah, and I’ve seen some companies shifting to the the people officer terminology. I think a good move. Peter: Yeah, it just humanizes it all. Peter: Whether it’s an audience of Engineers or an audience of creative people, I ask the question “what business are you in?” And I’ll get, you know, from accounting to auditing and whatever. I’m an artist. No. The main line of business you’re in is the people business, first and foremost. Because if you’re an artist and you have no one to sell to, you’re still going to be starving. Peter: If you’re an accountant and you have no clients to sell, you’re going to be out of business. So we’re all in the people business and I think the more that we can recognize our emotional intelligence… but let’s take this: you’re an engineer, I’m an accountant. We’re on on that right, very linear side of the brain. You know… feelings? At work?! Peter: Nothing personal, just business. Peter: The Mark Cubans of the world. Matt: Right, there’s no crying in baseball. Peter: Yeah, there’s no crying in baseball. There’s no crying in the office but we know that it happens, and we need to empathize more with the people around us and create a different type of work atmosphere. Matt: Yeah, I agree. And something just occurred to me, when you said failure is an option, if I can revisit that for a second because this just occurred to me. We’re saying it’s a really good idea to hold your hand up and say “look I made a mistake” and to expect that a great leader will do that, but also it’s worth recognizing that that’s not easy to do. When you’ve been put into a leadership position for the first time, it’s not easy to do. The other thing that I think is really important, other than being able to raise your hand and say I made a mistake, one of the key learnings I had early on is to admit when you don’t know, because I don’t know about you but I know I never wanted to admit that I didn’t know the answer to something if someone came. But I still remember the first time I was in a meeting with someone who I respected as a leader two levels up, and as we’re going around something came up and I didn’t understand what was being said. I thought, well, it’s because I’m the new guy, and she raised her hand and said “Can we start over again? I have no idea what we’re talking here. This doesn’t make any sense to me,” and it wasn’t that the person wasn’t communicating it really well. It was a new concept, and I thought I didn’t lose any respect for her. In fact, I gained respect for her and so I started doing that. Maybe the people that work for might say that Matt certainly didn’t know what was going on most of the time. Matt: But I was happy to admit it. Peter: That is a good point. Some people say fake it till you make, but no. It’s not that. If you don’t know something, you don’t understand something, then you gotta ask the question. People are afraid to raise their hand say could you repeat that because we don’t want to look stupid. We don’t want to ask that stupid question but I always say the stupid question is the one that’s never asked. Matt: Skip that step and let’s say this is what I’m going to do. It helps them grow and it makes your life a little bit easier. Peter: Yeah, a similar experience happened to me years ago. I went to my boss without a huge error that I made in a spreadsheet to about half a million, 3/4 million dollars. My boss at the time, you know most people kind of feared her, but I could make her laugh. Long story short, when I went in and told her of the problem I thought she was gonna chew me up and spit me out, but she was calm, cool and collected and said everything was fine, and then she said these words: “What’s your solution?” And then she saw the panic come about me and then she did all tasmanian devil on me. I walked in with a 36-inch waist and I walked out with a 32-inch waist. Peter: But I never came back to her, or anybody, after that point, when I had a problem. I would have some idea of how we could fix it. It might be right, it’s probably going to be wrong, but, as we say in improv: bad ideas are just bridges to good ideas. No ideas, in this case, almost got me killed. Peter: The idea that you bring or the solution that you come to might not be the correct solution, but it starts the conversation. Matt: Right, it shows that you’re adding value. I think the first partner that I ever worked for, when I started practicing law, my first mentor, said, “Here’s my advice to you: don’t have two things open on your desk at any one time. Open a file, work on it, close it before you move to the next one.” I don’t know if, in today’s world, that’s possible. But the second piece of advice he said “Anything you touch, add value to it.” It’s not enough that you’re just building time while you’re working on something. Once it’s left your possession, you need to have added value to the client with what you did. That really resonated with me because they don’t teach you that in law school. Matt: So to me, if I’m handed a problem, what value can I add? Even if it’s just I’m gonna start asking questions about it. Peter: So you’re working on a client, you’re working on a file, and you you’re in process mode. When you’re done, what have you done to that file to enhance it to “add value” to it? Peter: Because I like how you put it. When you’re coming in and you’re asking questions and you’re doing and you’re probing, you’re actually adding value to that process. So how do you do that if it’s in somewhat of a vacuum? You might be working on a client file and you’re finished with it and you close that file. What’s inside of that file that adds value, prior even any discussion? Matt: I don’t know. I don’t think there was ever a time when I could just open the file and close it and not have to document, somewhere, what I was doing. So it was either a memorandum, and you had to try and do it while it was fresh in your mind, or drafting a document. Something that captured what you thought because, as you’re starting off, that a value that you bring. And if I try to think even outside of law, these days it’s here’s something I’ve seen, let me put an email together to summarize my thoughts or questions and moving it along so that we’re closer to achieving whatever the goal is. Not just sitting back and saying I’ll come back to this later, which that never happens. Peter: Right, and the term adding value, in a lot of ways, I think it’s been viewed as a buzzword because it’s so overused. Except now I thought, I think for the first time, I’ve actually heard somebody put a definition or describe what true adding value is, especially in this situation. I just wrote it down: adding value is basically your thoughts, your perception of how you think this should go, and being able to communicate that in a manner that somebody else can understand. I think that might be, in my mind, the new definition of what adding value really is. Matt: Mm. Sounds okay to me. Peter: How are we gonna brand this? The Matt Horan view of adding value? Peter: I think we should get that trademarked. Matt: Yeah, let’s timestamp that. Peter: Let’s think this through a little more. You are an attorney, you can probably file the proper paperwork. Peter: I don’t think you have to call LegalZoom or anything like that. Peter: And you can get that done. To your point, as I move forward from this podcast, whether it’s seminars or conferences or things that I work on, I’m gonna ask who has the definition of adding value? And it goes back to my one point: I think it’s an overused buzzwords that we haven’t really thought about what it means, but we use it a lot. I think you put some meat on that bone, my friend. Matt: Okay, well let me know if you pick up any traction and I’m happy to give you credit for it because you summarized what I rambled. Peter: It wasn’t rambling. it really makes sense and it really resonated because, if you remember in my in the book, I wrote a chapter on corporate buzzwords and how it’s overused. And the more we hear these buzzwords, the more we quit listening. Peter: But now you put some meat on the bone. We say add value, but tell me how you added that value. Most people go uhhhh.. but it’s the memo, it’s maybe the call to the client. It’s something that we’ve done that we’ve been able to document to move that process forward, because adding value would be moving the process ahead versus, as you said, I’ll get to this later. Matt: Right. Let me take a look at it and I’ll come back to that. I need to sit and think on it, which is fine if that turns out to create something at the end. Peter: Yeah, so your point is, if we think about it now while it’s still fresh in my mind because, as we were talking about earlier, before we started the podcast, we were talking about how much we can forget walking from one room to the next. Matt: I can’t believe you outed me in front of all your listeners. Peter: Well, no, I’m out all of us because. I’ll out myself and I’ll tell you this: I could get out of the shower and dry off and I’ll forget a great idea I had in the shower, so actually I went on Amazon and bought this thing called Aqua Notes. Peter: I hang it in my shower and it has waterproof pencil so I have to write stuff down in the shower. Next I gotta buy a new pack because I keep burning through them. Peter: But to your point, you know, especially in today’s hectic lives, whether you’re an engineer or an attorney or an accountant or a salesperson, we’re running at such a high speed that, if we don’t take the time and focus for a moment to get those thoughts out so we can add value, if we come back later, we’re not going to remember everything that we had when it was fresh in our minds. Matt: No, I agree and I think you have to create space. When you commit to adding value to clients work, or anything you’re working on, you need to create space for yourself to do it. I’m sure you’re familiar, but there’s research out there about how long it takes us to refocus once our email alert comes on, even if we just hear it, and then if we glance up at it how long does it take for our physiology to reset to where it was before that happened? I want to say… you know this like 60% of statistics are made up in the moment? I’m gonna say, though, if I remember correctly, it’s about eight or nine seconds for us to refocus our our vision, but it takes maybe two-and-a-half to three minutes for our body to resettle to where it was before. You know, if that email makes us anxious or excited or angry. The bottom line is to create value for what you’re working on and remove all those distractions. Peter: I was at a conference and somebody made a comment that the average attention span is about six seconds. He pauses for a moment and I raised my hand and I said, “What did you say?” And he started to say it again and I was like, just making a point. But, if we have a hard time with our attention span, what if you’re an ADHD / dyslexic accountant? You can imagine how hard it is to maintain focus. Peter: So welcome to my world. Peter: Squirrels are running everywhere. Matt: Right, right. I saw the the coolest contraption today and it’s a six-sided cube and it has little things, like little buttons or knobs or different things that you can click on all six sides, so you can just get some of that energy out while you’re trying to focus on something else. Peter: I play with poker chips. Peter: When I’m sitting there in the times, if I have energy and I’m talking, I just like fiddle around with some poker chips. Do you think we can truly multitask? Matt: So that is such a great question, right? Because, for years, my response has always been no. I’ll say this: there is no research out there that I’m aware of that proves that you can effectively multitask. All any research that I’ve seen says that you really do lose a lot of focus when you move from one thing to another and try to do them at the same time, and that’s what I’ve been saying to groups for years. But I tell you what, as younger people are coming to my workshops and I’m meeting them and seeing them, they will fight me vehemently on that one. They’re like, I’ve grown up multitasking and I can do all these things. So I don’t know. I’m open to the possibility but, personally, I have not been convinced yet that you can. Peter: I’m convinced that you can’t. I think the situation that they think they can multitask is when they’re on the phone in a seminar, but if you just wait a few seconds and say excuse me can you tell me what I just said? And they won’t be able to. Peter: John Barlow was on an earlier episode and his theory was you can’t multitask with the same side of your brain. Peter: He’s a drummer and he said that’s the only way he’s been able to multitask because he’s using both sides of his brain when he’s playing the drums. Peter: He can be successful at that but he can’t drive a car and text. Peter: Or multitasking, and we’ll talk about leadership and attributes. So, if I’m the boss and somebody comes in and asks to take a few minutes of your time, sure, come on have a seat across the table, but I’ve got my desktop right here or I have my laptop and I’m not completely focused on this conversation because I’m looking over here. Peter: I become distracted with the dings and I’m not hearing everything you’re saying, and you start to wonder if I’m even hearing anything that you’re saying. Matt: Yeah, yeah. So now you’re not doing anything really well. You’re not doing anything 100% because whatever email is coming through you’re not focused on, you’re losing trust with that person, you’re potentially dealing with management issues and leadership issues that you’re going to have in the future because this person will want to go work for someone else who pays attention, or you missed what they said. There’s such a power to being present, in the moment, and I know that has kind of new agey sound to it but I totally agree that, in leadership, you need to be present – and people will appreciate it. Peter: Being present, being in the moment and being focused are also some of the principles of improvisation. So it’s not it’s not new agey, per se. Peter: Because you have to be you have to be really listening to that person and, in my workshops when I’m demonstrating this point, we’ll play this game called Last Words Spoken. I will start off a sentence and, whatever conversation is, when I stop it that last word becomes your first word, and we’re trying to make this cohesive sentence. Then you carry that off and then your last word becomes my first word. Peter: And it demonstrates that, a lot of times, if we’re not listening all the way through that sentence – if we’re for interrupting or we’ve already formed own agenda – we may be missing the biggest piece there, from them, and the more that we can listen to what they’re saying, the better the leader that we will become. Matt: Yeah, so that’s a really interesting lesson. It’s so funny. I think it’s pretty universal. It’s a lesson I learned in coaching too. As a coach, as human beings, we’re listening to our clients tell us our problems. It’s the same thing I did as a manager. I’m trying to help them come up with solutions and what do we? We get in solution mode, someone starts talking, “I’ve got this problem,” we listen listen listen and then oh wait there it is. I have the solution. Now I’m not listening anymore. I’m just waiting for them to finish speaking so I can share my solution with them and then I miss all the other stuff. So I tell people don’t worry about being clever when you’re coaching an employee. Don’t worry about being clever and having a solution. Just be curious. Just continue listening until they finish that last sentence and then trust yourself to come up with where you need to go from there – and it makes a lot easier, to be honest. Peter: It does. Studies have shown that when you’re finished talking, and if I pause for just a brief moment, the the person that you’re conversing with the level of respect is now notched up because they’re going he or she is now listening to me. That pause also allows you to formulate your next thought, whether it’s a question or statement or comment. All the while, I say you just park that agenda that you came in there with. Peter: And explore those ideas. I love another terminology in Improv: it’s don’t bring a cathedral, bring a prick. Peter: We see, a lot of times, we’ve got a problem and I want everybody to meet. We get together and I’m asking everyone their opinion and then I go well no, I came up with the idea. This is what we’re gonna do. Peter: and we’re sitting there like just wasted 45 minutes of my life because you should have just come in said this is what we’re going to do because you had already made up your mind. You brought the cathedral and… now we want to throw our bricks at you. Matt: Right right right [laughs] and thank you for, you know, not honoring this brick that I spent all this time making by hand, too, right? Matt: I was just talking to some leaders this week about making decisions and not letting our unconscious minds creep into our decisions, and as a leader not anchoring the decisions of your team. So coming in and saying “hey this is what I think we should do. What does everybody else think?” Let’s brainstorm, you know, what does everybody else think? Well of course there are already thinking about what you just told them. Matt: So don’t show them the picture of the cathedral. Peter: [laughs] But that is a good point. If he truly wants to solicit their ideas he should come in and say here’s our problem. Peter: Tell me what you think. A lot of times, to your point, we might be intimidated about what we say because we don’t want to say something stupid or be perceived as wrong. I’ll have a bad idea. So I challenged those leaders to be one of the first ones to throw out a bad idea, just to set the set the mood in the room a little better. If he can do it maybe I can start throwing stuff out and it’s creating that culture for it. Peter: [laughs] I’ve heard that one, and that’s a great point. One of my newest quotes, and I’m just pulling it up here. I have a cousin of mine who lives in New Haven, Connecticut. He is a graduate of Yale and he teaches at a school there, an arts school, and he showed me the campus, and above one of the doors was this quote that says “You can’t use up creativity. The more you use, the more you have.” It is by Maya Angelou. Peter: It’s a great quote. Matt: I haven’t heard it before but I absolutely agree with it. Peter: and I thought was a great quote as it relates to creativity. You can never use it up. Peter: I love asking CPAs are you creative and they go no, and I’m like not Enron creative. Peter: Are you creative? And they still go no and I say okay let me ask a question differently. Do you have ideas? And they’ll go yes. Then you’re all creative. Creativity comes from the idea: a tornado and a shark. Somebody had to have that idea or somebody had the idea of New Coke. That wasn’t a really good idea. Peter: and somebody had to have the idea let’s put three frogs on lily pads in a swamp and have them say bud- wei- ser-. Peter: So we all have ideas. This ability to get the idea out on the table, not feeling intimidated and not feeling judged, and, as I said this panel discussion yesterday, I don’t like the word innovation. It kinda goes back to something that I learned when we were at The Mind Gym, because innovation is the word creativity. Peter: and I’ve separated the two. In order to be creative you have to get the quantity of ideas out and then once you look at innovation then we could put on the the devil’s advocate or the critic or the judgment piece, but I see that when we put it together there’s a lot of judgment being placed on generating those ideas, and that just stifles creativity. Matt: instead of… you know, some of The Mind Gym work on creativity is teaching people the Yes And tool, during creative thinking, and it’s so funny to see how much people struggle with it. Peter: But then when we do the yes and it’s much more collaborative. As long as we keep that piece in that creative process, it’ll take us a down a longer, more productive path – and also be inspiring and motivating to the staff and the people we work with. Matt: Yes… and I think that’s a great idea. Peter: A couple years ago, it was in Fast Company I believe, they did a whole piece on creativity and they did a survey. I don’t remember the population of the survey but they said 73% of those who were surveyed, and these were at leaders within industries, said that 73% felt that creativity was the number one attribute needed today in leadership. However, only 23% were utilizing it. Matt: I mean, I’m not surprised. Mind Gym came up with the seven skills of a good manager and I believe they nailed it, and one of those is innovation. The ability to be creative. It’s a skill that people need to be an effective leader today, and it’s not creating New Coke, right? Matt: It’s not creating the new electric car. It’s just thinking about a new way to do things and using that brain that you have. How many people have a half-an-hour carved out on their calendar 15 minutes every week that’s dedicated to creative space. You don’t, right? Matt: But you probably have time for meetings and you probably work through your to-do list every week, but it’s a critical thing. So I’m not surprised when you say 23%. Peter: Yeah about 23%. Then I think, has big corporate America stifled creativity amongst the workforce? I think the larger organization its do this do this do this and don’t be creative in what you’re doing. I just need to get the job done. And that could be the death of a company. Matt: Sure. So I think it’s always just doing those incremental things, on your own individual basis. What are the incremental things that I can use my creativity to do this thing smarter? Peter: It’s about finding. It’s not always coming up with new Coke or the ads, like you said, but if someone said this is the way we’ve always done it. Peter: I go that’s a sign that we need to fix it. Peter: Because it’s outdated. But now I’m going down this path of managing change because now… to change it, okay, I’m in a comfort zone. I like repetition. I feel comfortable. Now I’m going to upset the apple cart and do something different, and that just opens a whole new basket of of issues that could arise in that, but it needs to be done. Matt: Right, and you’re right you need to be aware of that basket that you’re opening because human beings are all resistant to change. You’ve probably done workshops on change. I have too. You do exercises where you get people to try and make little miniscule changes, and as soon as you free them up they go right back to where they were. And I’m the same way. We all like the way things are and so you have to be aware of that and manage that process and guide people through that change. Otherwise you’re pushing the river, as they say. Peter: [laughs] pushing the river. Yeah, in the other direction. Peter: Yeah and to get people to buy into change takes a lot. It’s a whole other conversation that we could have probably, for an hour so, but the one thing I’ve always said is that there’s some people for whom it doesn’t matter. Any type of change is negative. Peter: I’ve always tried to look at change as an opportunity. If we’re changing something then maybe there’s something better for me, maybe something I could do, and sometimes that change could maybe displace us out of a job. In 1999, I was laid off, restructured, re-engineered, fired, whatever, from Victoria’s Secret catalog and it was devastating. Peter: But if that hadn’t happened, because someone told me after that first week that “this time off will be the best thing that could ever happen to you.” And for a moment I’m thinking all I heard was wah wah wah wah wah. Peter: But, you know, within a couple weeks I was like that person was right, this is the best thing that could happen because now I got a chance to reflect, figure out what I want to do when I grow up, starting to figure it out but what I want to do when I grow up, maybe there’s a different angle I want to take. I wouldn’t have had that opportunity had that change not occurred. Matt: Right, right. I’ve worked with a lot of people who have been in that position. When my wife came to me and said Matt I know you just got a promotion and you are enjoying your work but I really want to live overseas, that’s the journey I want to take. Matt: I wasn’t expecting that. But you have to embrace that and say, if I didn’t, I wouldn’t be where I am today, which is much richer. I think you have to be open to those. You have to look to those opportunities. I don’t know… life is a journey. Peter: Learning this different than compliance. Peter: and I would say, from the aspect of compliance, you need to be technically sound. Get your 40 hours and that, but find different ways. You can read a book, you can read Lincoln’s Leadership. You’re not going to be a leader like Lincoln but you can learn from it. You can read Giuliani’s book, you can listen to podcasts like this. You can explore and volunteer, take leadership roles. But you just have to get out there and… just go ask your boss, you know, can you put me on a committee or is there a presentation coming up that I could do? That I could be a part of? I think that, from the the millennial generation, which is one thing I do really enjoy about them, is they can be assertive. Peter: Just be assertive and and ask for the work and ask for the opportunities, and I think that’s the best place to start in developing your overall leadership abilities. Matt: I agree. Do a hard look in the mirror saying what do I want and why do I want it, why do I want to be a leader, or what’s in it for me? Understanding what I want and then being really clear about setting goals to get it, whether it’s shadowing other leaders, whether it’s doing some research, reading. I mean there are so many great books on leadership and just some of the biographies of some of the great leaders throughout time. You can learn so many of the same lessons that people are learning over and over and over again reading books, listening to podcasts. Anything like that, but setting goals based on what you want to achieve. Why you’re doing it, I think, is really important. And then, if you can find a mentor, and not being afraid to find a mentor and not being afraid to ask for it. That’s something I recommend to everybody. Peter: And to that point, what’s in it for me but once what’s in that leadership role, that focus change. What’s in it for them? Peter: And some leaders don’t look at it that way. It’s still about them. But once you are in that leadership role and you’re managing people it’s not about you. It’s about them or making your people look the best that they can and, as you said earlier, the mirror and the window approach. Give them the accolades and you take the responsibility. When something doesn’t go right, don’t throw your team under the bus. Matt: Absolutely. You just reminded me: one of the things that was always in my mind when was a naval officer. So I guess I was still at the academy, but one of my highschool friends who had gone straight from high school with enlisted with the Marine Corp. So I’m learning how to be an officer. I’m going to be leading troops and he’s already an enlisted marine. Coming out of the Navy you can be a Marine Corps officer too. I saw him at some christmas party or something and he said “Hey you know I’ve been doing this for 2-3 years now. Can I give you some advice?” I said absolutely, please, and he said “Just remember that these guys, these men (it was all men at the time, men and women now) they’re looking to you. They need you to have their best interests in mind. You’re their guy.” It was fate. I don’t know… I always remembered his face because he was a friend of mine. He was one of these guys that you show up on the ship and you’ve got a division of twelve-thirteen people and you’re trying to think how do I accomplish the mission with these people, but it made me realize that these are all guys who went to high school, who have families and are trying to accomplish what they need to accomplish, and it just changed the way I looked at things. I always try to make it about the people and I think the same thing applies in business. You have to think about these people for who they are. So thanks for listening to that story. Peter: Oh, you’ve had some really great stories and I like how a lot of went back to your days at the Naval Academy and… okay, so this is gonna sound funny, but you just clarified something for me. I didn’t realize that, when you graduate from Naval Academy, that you could go and be in the Marines. Peter: Now you’ve clarified the whole NCIS show, because I was always wonder why the NCIS were always helping the Marines out. Peter: I thought maybe that’s a flaw of the show but now you’ve straighten that out for me and I appreciate. Matt: That’s right. The Marine Corp is part of the department of the Navy. Peter: Yeah, that’s cool. Well, Matt, any last parting thoughts to my audience? Matt: That’s a big question. You know, I think we’ve covered an awful lot, Pete, and thanks again for inviting me. It’s been a real pleasure talking about these things. I would just say that, going back to what I said at the very beginning, is just, if you want to be a leader and work on your self-awareness, there’s a quote from Tim Gallwey, who wrote The Inner Game of Tennis and The Inner Game of Work, and his phrase is “awareness is curative.” If we’re aware of any situation, our unconscious mind allows us to fix it because we have those innate talents. So, if you’re aware of what you want to achieve, if you’re aware of your personality and what you want, you will just naturally start to be a better leader. If you’re aware of the people that you’re interacting with, you will do a better job. So I guess that’s the last thing I’ll leave, but thanks again. Peter: Oh, I can’t thank you enough. I always enjoy our conversations and I’m gonna put you on the spot. You will be back. We’ll have another one of these because you bring a lot of great insight to this. You bring a different perspective to it, which I think is refreshing in a lot of ways, and you came up with what the definition of adding value is to me. That right there is the nugget for the day and I will be giving you a lot of credit on that. Peter: and I’ll use that in the future, but thank you. I guess, as we part, Chuck, if you’re still listening through all of this, I guess we let you off the hook this time. Peter: Well I think the next one we will have to spend more time having fun at your brother-in-law’s expense.